Bird Watching: Our tailormade Sri Lanka birding holidays & tours combine both the wildlife & cultural heritage of this beautiful country. Visit Yala National Park, Bundala, Sinharaja rainforest, Minneriya, Horton Plains, Uduwalawe & the cultural sights around Kandy, before whale watching in Mirissa & relaxing on the Galle coast. English speaking driver/guide, local birding guides & specified sightseeing included. Return to your hotel for lunch, before enjoying an afternoon jeep safari in Minneriya National Park, accompanied by a birding guide. Birdlife is prolific in this park, where you can also hope to see wild Asian elephants. The elephants are particularly numerous in August and September, when they migrate along a corridor from neighbouring parks to feed on the fresh grass on the lake bed - an annual event known as "The Gathering". Set out early this morning for a walk with a local birding guide into Udawatta Kele Sanctuary, an unspoilt forest reserve on a hilly ridge overlooking the city. In addition to the birdlife, you can also see many different plant species, butterflies, monkeys and other small mammals and reptiles. In the afternoon we visit the beautiful Peradeniya Botanical Gardens. Dating back to colonial times, this magnificant property has abundant bird life, including a bat colony. It also has a rare collection of indigenous tropical flora, including an Orchid House. We suggest you ask your hotel to pack a picnic today, so that you can enjoy it in these gardens. 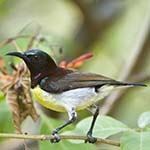 Today travel 1.5-hours with a local birding guide to Kitulgala Forest Reserve in the Kelani Valley, which was established to protect the watershed of the Kelani River and is home to many endemic flora and fauna species. The breathtaking scenery here was used for the famous film "Bridge over the River Kwai" and a boat trip across this river is a very special experience. This area is also famous for its adventure activities, including white water rafting down the Kelani River (grade 3 and 4 rapids); trekking in the jungle and mountain biking in the jungle-clad hills. Sri Lanka's most recently discovered bird, the Serendib scops owl, was first heard calling in these forests and the hills above the tea and rubber plantations host mountain hawk eagle, crested treeswift and Layard's parakeet. Enjoy a 5-mile (9.5-km) round trip hike with a local birding guide, walking along the scenic trail leading to World's End viewing point and Bakers' Falls, before returning to Nuwara Eliya - so wear good trainers or walking boots. Rise early today to enjoy the wildlife of Yala National Park, accompanied by a local birding guide. Yala is home to over 40 different species of mammals and also known locally as Ruhuna National Park. Whilst famous for its over 35 leopards, you can also see water buffalo, elephants, spotted & barking deer, wild boar, sambar, crocodiles, jackals, monkeys and mongoose. Sloth bears are also present but are rarely seen. This morning we travel 30-minutes for a jeep safari with a local birding guide into the much quieter Bundala National Park, a UNESCO biosphere reserve with five shallow brackish lagoons separated by thick low scrubby forest and coastal sand dunes,.that stretches along the southern Sri Lankan coast for nearly 13 miles (20 km). The first wetland to be declared a RAMSAR site in Sri Lanka, this bird sanctuary shelters nearly 200 different species - the highlight being the greater flamingo, which migrates here in large flocks. This coastal wetland is also a very important wintering ground for migratory water birds that arrive between September and March, which is the best time to visit. The lagoons attract an amazing variety of aquatic birds including ibis, pelicans, painted storks, egrets and spoonbills. You will also see many peacocks perching in the branches of tall rosewood trees. Bundala is also home to 32 species of mammals including the excitable grey langur monkey, civet, mongoose, wild pig, giant Indian palm squirrel and black-naped hare. There are also a few elephants, lots of land monitors, enormous crocodiles that sun themselves along the lagoons, and five species of turtle that lay their eggs on the beaches. Although it doesn’t have the range of wildlife found in nearby Yala National Park, Bundala offers a much quieter alternative without the crowds. There will also be the opportunity to do some birding on foot outside the park, as you cannot alight from the jeep inside the national park. This morning enjoy another early morning safari into Yala National Park. Afterwards we travel 2-hours to Udawalawe National Park. Along the way we visit the pilgrimage town of Kataragama - sacred to the Buddhist, Hindu, Muslim and local Vedda people. Here you can view the Kiri Vehera, an ancient Buddhist stupa (sacred mound containing relics) dating back to the 6th century BC. There is also a multi-faith temple on the site. On arrival in Udawalawe enjoy birding on foot with a guide on the outskirts of this wildlife reserve, that was created to provide sanctuary for animals displaced by the Udawalawe Reservoir and offers the best sightings of wild Asian elephants in Sri Lanka. It is an important habitat for many water birds, as well as water buffalo, spotted deer, barking deer, wild boar, sambar, jackal, mongoose and jungle cat. The nocturnal fishing cat is also found here, but is rarely seen. This morning we visit the Udawalawe Elephant Transit Home that cares for orphaned calves and re-introduces them into the wild, where you can get close to these gentle giants. We then travel 3-hours to the town of Deniyaya, the gateway to the Sinharaja Rainforest. On arrival enjoy a walk in the grounds of your lodge, accompanied by a local birding guide. Today enjoy birding on foot with a local birding guide in Sinharaja Rainforest, a biodiversity hotspot that is one of very few remaining virgin lowland rainforests in the world and now a World Heritage Site. Although only 13 miles (21 km) wide, this pristine rainforest is home to 95% of the endemic birds of Sri Lanka as well as many species of trees, insects, amphibians, reptiles and mammals. However wildlife is not easily seen here, because of the dense vegetation. Enjoy a final morning of birding with your guide in the grounds of your lodge at Sinharaja Rainforest. Afterwards we travel 2.5-hours to your hotel on the Galle Coast, in the vicinity of the fortified town of Galle. Galle Fort has a colourful history, as it was originally built by the Portuguese and later heavily fortified by the Dutch. It is today a World Heritage site, with a multi-ethnic and multi-religious population living within its walls. After visiting the town, your guide will drop you off at your beach hotel along this beautiful coast.